How much does it cost to travel to Belgium? How much money will you need in Belgium? €105 ($118) is the average daily price for traveling in Belgium. The average price of food for one day is €32 ($36). The average price of a hotel for a couple is €100 ($112). Additional pricing is in the table below. These average travel prices have been collected from other travelers to help you plan your own travel budget. How much money do I need for Belgium? Belgium is a low lying country located on the North Sea in the Benelux. It is split into two areas with a Germanic north and a Latin south. Although very diverse, it is a relatively small country with a densely packed population. It is most known for its role in the European Union, where its capital, Brussels, serves as the union's headquarters. This country is often overlooked by many travelers, but within this small country there's a rich history that is impressively intertwined with striking modernization. There are actually many cities worth visiting in the area, all of which have a rich history and culture that is still evident today. The country has many popular festivals and events which draw crowds from all over Europe. In particular, the Ducasse de Mons is a fun parade that takes place every year. The town of Binche is a fun place to visit every February during the Carnival de Binche. This festival celebrates the area's history and culture by recreating a 16th century town. The Dour Festival, held every July, celebrates Europe's alternative music scene and Gentse Feesten, in the second half of July lasts for ten days and is the largest street festival in Europe. It's held in the city's historical center and has everything from theater to music, food and arts. Belgium is comparable in cost to most Western European countries. You can save money on food by grabbing cheap meals at sandwich shops. If you're eating in the more touristy areas, make sure they don't bring you food that is presented as "free." You're likely to be surprised with a bill later in the meal. Also seek out the free attractions in cities. There are plenty of things in the area worth visiting that cost you nothing. Transportation, like elsewhere, is better booked in advance and advanced reservations for hotels are also recommended. In general Belgium is a reasonably priced country but with a little preparation you can make sure your money takes you farther. Waterloo: Visit the location of the battle which ended the Napoleonic Wars in 1815. You can climb to the top of the hill for a view of the surrounding area including the battlefield. You can also visit the Wellington Museum for a more in depth tour. The Groeninge Museum: This is an impressive museum that has on display an exhibit of six centuries of Flemish, Dutch and Belgian paintings. 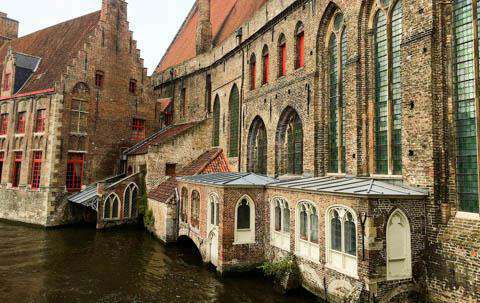 It's located in Bruges, Belgium and is one of the country's most impressive museums. Gravensteen Castle: While Belgium has over 300 castles, this one is perhaps the most popular and well known. Located in the city of Ghent, it dates back to the Middle Ages. It is partially surrounded by a moat, and inside the castle you will find a museum that displays various torture devices used throughout history. Frikandel: This is a minced meat hotdog that is usually eaten as a snack from a fast food joint. It's usually deep fried and served hot with a side of a salad or fries. It's a cheap but popular food item. Gehaktbal: This is a ground beef meatball that is made with bread crumbs and onions and often served with fries. The meatballs are usually hand rolled and either fried, baked, steamed, or braised in a flavorful sauce. Kroket: This is a fried roll, usually made from potatoes and stuffed with a meat such as beef, veal, or chicken. It is available in fast food form for cheap on the streets, but a fancier version is often prepared for Christmas meals as well. Because Belgium is so small, it's quite easy to get around. There's a great public transportation system and you can reach most destinations within a couple of hours. Trains are frequent, fast, and affordable. If you're going a shorter distance, it's probably easiest to look into a bus, which are also quite convenient. Check out the convenient website at InfoTEC (http://www.infotec.be) for an easy to use route planner that covers many forms of transportation. Like most other countries, you'll find the best restaurants if you avoid the obviously tourist trap places. These places tend to be way over prices for the quality, can be crowded, and are generally not as good as the more local restaurants. It's also important to realize that the cost of food in Belgium has gone up dramatically in recent years.Generally the cheapest dishes you'll find will be sausages, potatoes and spinach. For a three course dinner you can expect to pay about thirty to fifty euros at a nice restaurant. For more affordable options head to a local 'frituur' which will serve you up some cheap, greasy foods. Drinking beer in Belgium is a national past time. You'll find a large variety of interesting options to sample. Definitely try some of the Abbey beers. These beers got their name because the modern breweries were former monasteries which in medieval times were the location of beer brewery. The large varieties that historically existed are still around today, although they have been modified to appeal to modern taste buds. They're a unique thing to sample while you're in this country.